A convenient way to add games to RetroX is using a NAS server, this will allow to share your game collection to all your RetroX devices in your home network. It’s like having your “own cloud” in your own home. You can find several commercial NAS solutions, but for RetroX you can simply use a Raspberry Pi and one or more USB drives. Using this guide you will turn your Raspberry Pi in a cool NAS device for RetroX. 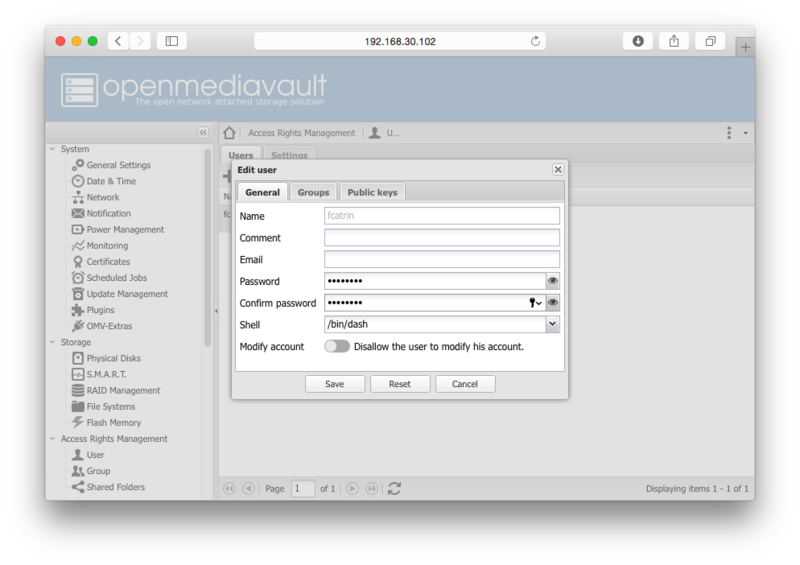 The first step is to download OpenMediaVault (OMV). This is a Linux distribution to build a NAS server solution easily, it has a web based console where you can do a lot of things, including sharing your folders for RetroX. This is what we will use as a base. Just follow the instructions provided to create a bootable USD disk. You will end with OMV in your SD Card. Put the SD Card in your Raspberry Pi, connect the ethernet cable and turn it on. Open a web browser in any computer in your home network using the ip address provided. Then log in with the user and password. In the screenshot below, my IP address is 192.168.30.102 and my user was admin. Network -> General -> Hostname : This is the name for your NAS. Keep it short and simple. You can share any folder from your SD Card, if that’s enough for you, you can skip this step. If not, plug your USB drive and go to Storage -> File Systems. You will see your USB Drive listed with its label. If you haven’t set a label in your drive, look at those devices named as “/dev/sd…“. At first, the drive will not be mounted, that is, the drive will be connected but not ready to be used by OMV. Just select the drive and then press on Mount to make it available for OMV. Once mounted you will see the amount of total and free space in the drive as shown above. You can add as many drives as you want. You can share your folders to be accessed with no user/password, but that will restrict you to access them as read-only, so you won’t be able to add new files from other computers. It is recommended to create a user that will be able to write in the drive. Note that this doesn’t mean that you will need to put an user and password every time you access the drive, only that if you need to write in the drive, you can connect to your NAS with this authorized user. Go to Access Rights Management -> Users and press Add to create a new user. Just set the name and password. Consider to use the simplest name possible, a lowercase of your initials is a safe bet. Here I choose fcatrin as my user name. Shared folders in OMV are independent of the protocol being used to share them later (SMB, NFS, etc). In this stage you will define where is the folder to share and how the permissions will be set. In the following sample shot, the “games” folder in the FAT16GB device will be shared as RetroXGames. Your shared folders can be shared using several service protocols, here we will focus only in SMB/CIFS which is what RetroX uses.